Jane Yolen is the Tom Brady of Children’s Literature. She’s been in the league forever, has won tons of trophies, and is great at everything. EVERYTHING. 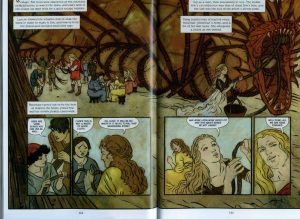 So it should come as no surprise that her re-released graphic novel for tweens and young teens, The Last Dragon, is absorbing, surprising, stereotype-crushing, and beautifully told. The art, by Rebecca Guay, is stunning, almost classical, and gives great depth and an artistic quality to the story. Most of the graphic novels I review are for kids. Some for kids and teens. The following series is for older teens and adults, due to graphic violence, explicit language, and sexual situations. That warning being given, I would like to introduce you to one of the great horror comics of our time: Locke & Key, created by Joe Hill and Gabriel Rodriguz. I also want to give a shout-out to colorist Jay Fotos, who gives the art a brooding, autumnal quality that truly lends to the mood of this series. Look at what the authors do on this spread, which occurs right at the beginning of the book. This is the left side of the page, where you are SUPPOSED to look first. 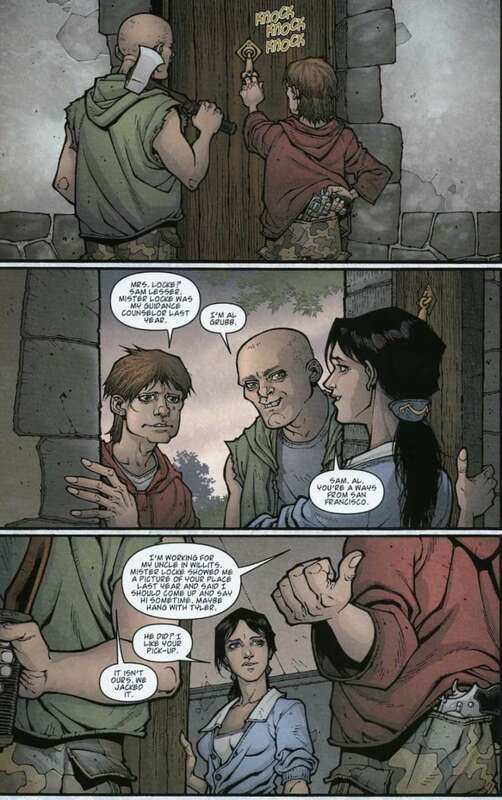 I was introduced to Birthright (Image), written by Joshua Williamson, art by Andrei Bressan and Adriano Lucas, by the manager of a comics shop in Atlanta called Oxford Comics. It’s a great store, and his was a great suggestion. The Birthright storyline and characters get under your skin quickly. Mikey, the main character, gets lost as a boy, leading the community to think his irresponsible father may have killed him. But he shows up a year later as a muscular warrior from another dimension — and all you-know-what breaks loose. 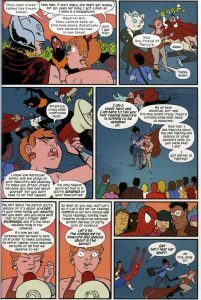 Who would have thought that a college-age female super hero who can talk to squirrels would beat up Spider-man, steal a suit from Iron Man, and subdue Galactus (Devourer of Worlds), all in one week? And mostly without actually fighting — except when she has to. 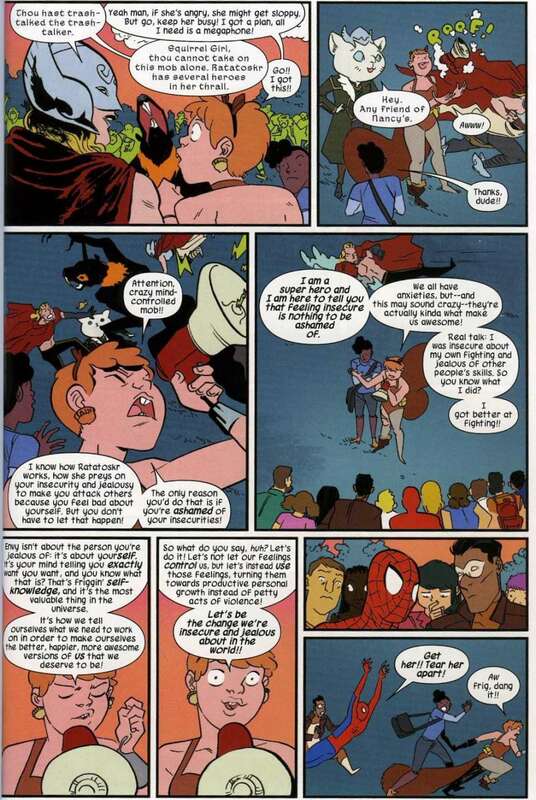 You see, Squirrel Girl, aka Doreen Green, the completely normal college student at Empire State University, is called upon to save the world from a variety of colorful and dangerous villains. Which she does with humor and bravery, and possibly some flirting with cute college guys (who also turn out to be super heroes). Zita is a hero. 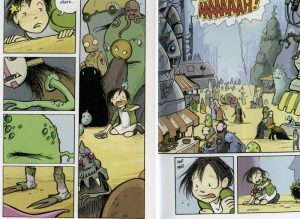 If you’ve got an elementary schooler who likes graphic books — and let’s face, it, what elementary student doesn’t? — you MUST introduce him or her to Zita The Space Girl (First Second). A lot of good stories center on theme of redemption. Author and artist Ben Hatke includes so many layers of redemption here you almost feel absolved of your own poor choices after you’re done reading it. I don’t mean to imply the story is pedantic or preachy — on the contrary, the narrative is super fast, delightfully suspenseful, and full of imaginative characters. Check out this spread. Zita wakes up and sees this colorful, frightening world. 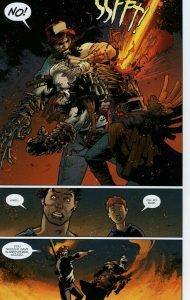 Look at this spread from Huck, Book 1: All American, written by Mark Millar, with art by Fafael Albuquerque and colors by Dave McCaig (Image Comics). This is everything I love about comics and graphic novels. 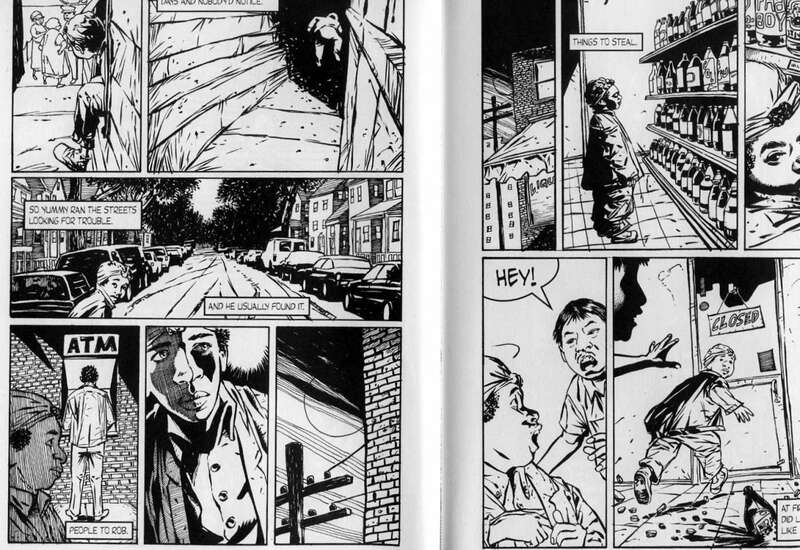 Sense the speed in the top left panel as the main character — Huck — begins to run, even though you can only see the blur of his feet. The next panel should bring a grin to your face as you observe the grin on Huck’s face. 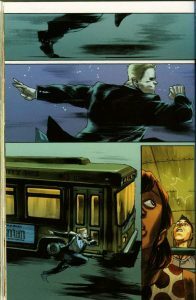 At the bottom of the page, feel Huck’s passion as he runs faster than a bus, then leaps on top of it. Of course, you can’t see him land on the bus, because he’s out of the frame, but you can observe the surprise of the passengers as they “hear” him land above them. 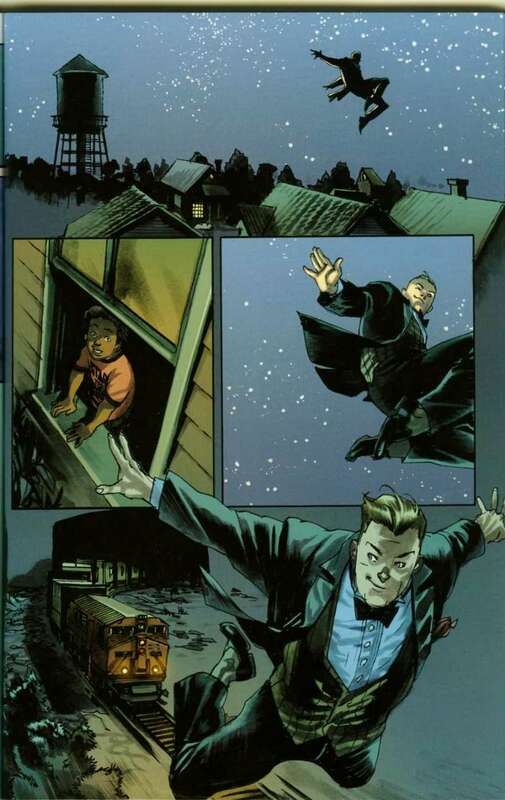 All of this happens in the “gutter” or blank space between panels, so your imagination willingly fills in the story. On the right side of the spread, get to know Huck’s character as he winks at a little boy as he flies over the rooftops. Feel his joy as he flies onto a moving train. His head and hands intrude into the panels above him as he literally breaks out of any kind of mold or constraints. It’s pure visual ecstasy. 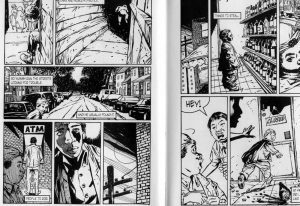 I have nothing against dialogue, but this spread, with no words, tells so much of the story. But more than telling the story, the writer and artist let us “feel” the story.